This is a sponsored post from Red Funnel Ferries. Feel the need to escape the city? How about a mini-getaway to the Isle of Wight with the family or a bunch of mates? It's a UK break but easy to get to and across some water, so it feels you're really on holiday. Around an hour and a half on the road from London, then roll on and off the Red Funnel Ferry and voila - you've landed on the Garden Isle. There's lots to see and do on the island this summer. Enjoy the sandy beaches and stunning scenery. Put your best feet forward for the Isle of Wight Walking Festival, 7-22 May. Visit Victoria and Albert's Osborne House or historic Carisbrooke Castle, ride the steam railway and see the tigers at the Zoo's Tiger Sanctuary. Spend some time exploring the botanic garden and Isle of Wight vineyards. Active types can try some adrenaline sports or some of the many more gentle outdoor pursuits. There's bound to be something that tickles your short break fancy. Enter this prize draw and you could win one of two free Short Break ferry crossings to the Isle of Wight from Southampton for a car and up to 6 people, with tickets to either Osborne House or Carisbrooke Castle included. Simply enter your name and email address in the form below and two winners will be picked at random on Friday 22 April at midday. Good luck! Londonist and Red Funnel ferries have teamed up to offer you this prize, giving you a great opportunity to visit the Isle of Wight this summer. 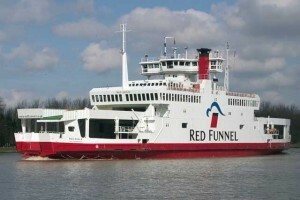 Red Funnel have been providing ferry services to the Isle of Wight for 150 years. Their website is a great resource for planning your Isle of Wight holidays and searching for the very best Isle of Wight hotels. Terms and conditions: Not valid for use on 22 April to 3 May 2011 9,10,13 June 2011 and 8,9 and 12 September 2011. Prize must be taken by 31 October 2011. Valid for a car only. Winners will be notified by email. Competition closes at midday on Friday 22 April.